iLounge reports that authorized hardware accessories for the iPhone and iPod touch now possess the ability to prompt users upon connection if a companion App Store application is required for the device to function and link the user directly to the App Store listing for the required application. 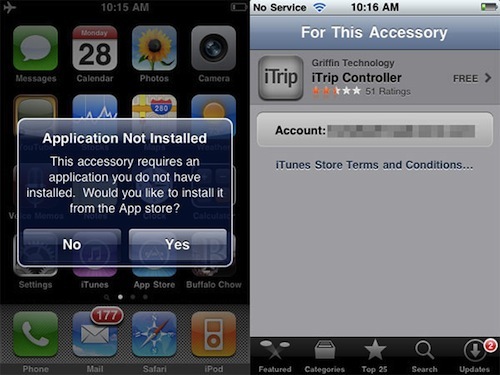 When connecting such an accessory to an iPhone or iPod touch for the first time, an alert box labeled "Application Not Installed" appears, informing users that the accessory requires an application which is not currently installed, and asking if they would like to install the application from the App Store. Upon acceptance, the iPhone or iPod touch then takes users to a new "For This Accessory" page on the App Store, with a direct link to the necessary app's listing, from which they can download and install the application. iLounge notes that the feature was most likely introduced as part of iPhone OS 3.0 earlier this year, but accessories supporting it appear to just now be coming available.